The Zimbabwe Electoral Commission (ZEC) has completed printing presidential ballot papers for the July 30 harmonised elections. The electoral body yesterday said the number of ballot papers printed would be published as soon as required by the Electoral Act. ZEC commissioner Dr Qhubani Moyo told The Herald that all was set for the polls. “We can confirm that the presidential ballot paper has been printed and is complete,” he said. He added: “We are also going to publish the printing company because the requirement in terms of the Electoral Law is that we must tell people the number of ballot papers that have been printed and the company that printed them. This flies in the face of MDC-Alliance which yesterday staged a demonstration claiming they did not know who was printing the ballot papers and where they were being printed even after being taken to the premises. ZEC is constitutionally mandated to administer all electoral processes in the country, including all material issues relating to the printing of the ballot paper. 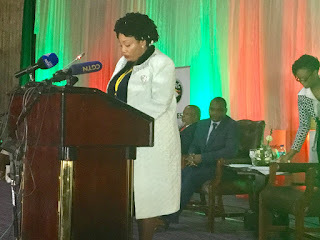 Justice Chigumba said any political party that felt aggrieved by the law was free to seek relief from anyone. She said the electoral body went beyond its constitutional mandate two weeks ago to invite political parties to observe the printing of the ballot paper. She said in other jurisdictions, stakeholders were allowed to “touch the ballot or feel it” because they had a legislative framework for that. “The strict letter of the law is that we have the exclusive constitutional mandate to procure ballot paper, to design it, to print it and to distribute it,” said Justice Chigumba on Monday. She added: “We will not be releasing pictures of voters to the public and this is because the right to access to information is not absolute. It must be juggled with the right to privacy. The format in which we have released the voters’ roll, and the information that we have given on the voters’ roll, is sufficient to fulfil our constitutional mandate, that we must provide a final voters’ roll which is analysable and which is searchable.